In Part 1 of this series, we walked through creating of the actual databases for managing our FBA users, as well as the general scope of this blog series. Today, we are going to focus on the configuration of SharePoint [insert crowd roar here]. Ok, ok, I know you are excited, this however, is the hardest part IMHO, so, please pay attention, and try to color inside the lines to the best of your ability while we are following this exercise. First, let us do a quick definition of what these are. Membership Providers are the authentication sources for applications. A provider can be a number of back ends (LDAP, SQL, 3rd party application, or a custom membership provider). In our specific case here, we are using SQL, specifically, the ASP.NET Membership Database. If you look at the tables we created in Part 1, you can see how this provider stores a username, password, and other information about the user. Just like active directory, it can hold information about a user, and also be used for authentication. Role Managers are similar to membership providers, however, these are more like groups in Active Directory. A person in the membership provider can belong to a number of different roles, or groups. We will be configuring these as well. So, hopefully the brief introduction to these terms above is enough to make sense, so we can move onto our next bit. Now that we have our database up and running, we need to extend our web application in SharePoint 2010, so that we can create an FBA-Only authentication portal, for our partners at Contoso to access. To do so, we need to enable Claims Based Authentication on our site, because it is already created, we need to enable our existing site to be “Claims aware”. To do so, go into Central Administration. And then click on Extend up in the Ribbon. Then select the Extranet zone. This doesn’t do anything but classify the extended web application, and allow us to modify the authentication methods used. Then click OK.
You will notice that we cannot change the authentication type from Windows to Forms. This will enable Claims authentication on our web application. Click on the Extranet again, you will now see that we can change the authentication type for this web application. If you want to have both AD users as well as FBA users to be access the same portal with their respective accounts, go ahead and check both Enable Windows Authentication as well as Enable Forms Based Authentication. Remember how I listed the Membership Provider and the Role Manager at the beginning of this article? Now is when I make use of those. Now go to the bottom and click on Save. 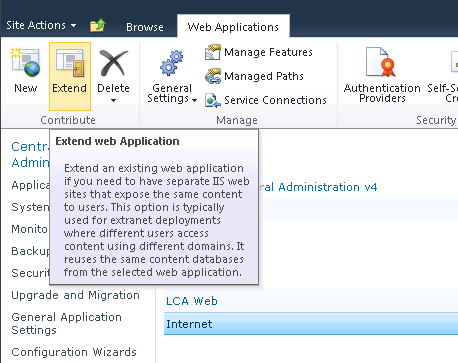 SharePoint will deal with the configuration of this web application. Search for </SharePoint>, which should appear right before <system.web>, and insert the following code, after </SharePoint>, and before <system.web>. And where the two highlighted bits are above, insert your SQL server name, and FBA database name respectively. (see Part 1 for creating this database). Once that is complete, locate the end of the </system.web>, mentioned above, where we just put the connectionStrings information above. It will be right above </system.webServer>. there are many other system.web declarations within this file, so be sure to use the right one. You should see tags in the XML for membership and rolemanager there. 9: description="Stores and Retrieves membership data from SQL Server"
Make sure that the connectionStringName and name attributes match the connection string we used above, as well as the membership provider name we used in SharePoint respectively. 3: description="Stores and retrieves roles from SQL Server"
again, making sure that the connectionStringname and name attributes match the connection string we used above, as well as the role manager name we used in SharePoint respectively. Then save the web.config file. We will be editing in the same places within the config file that we did for our extranet web application above, but with just a few slight changes. So, first, locate the closing </SharePoint> tag, and the opening <system.web>. Just as we did above, we are going to paste in our connection strings here. 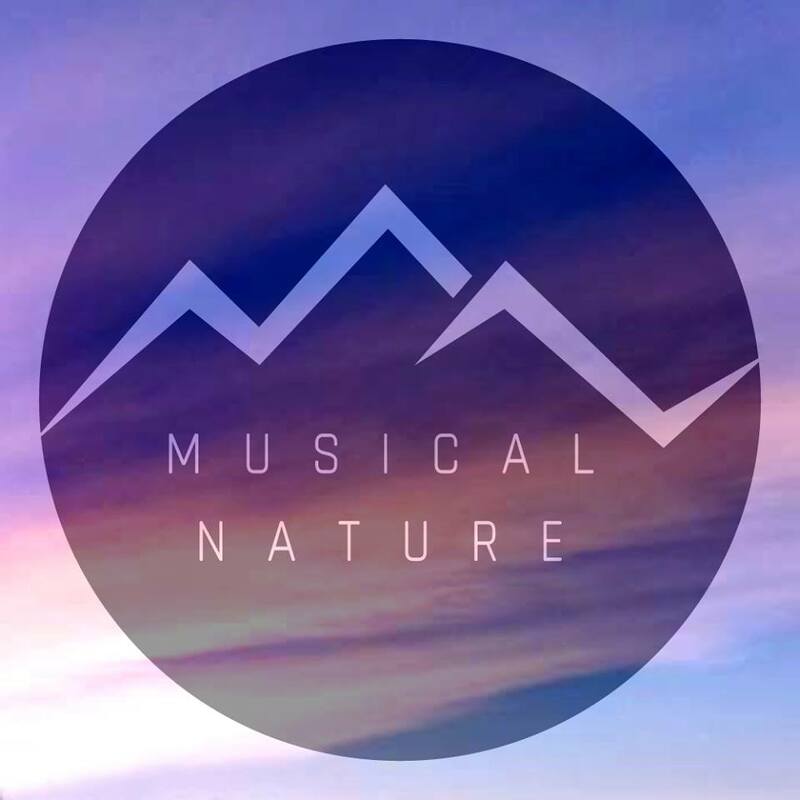 And next, as you may have guessed, just before we close out the </system.web> tag in this web.config, we need to put in our membership provider and role information. This is slightly different from the one we used for the extranet web.config above, notice the default membership provider. Don’t change this – leave this as-is. It is NOT a typo. Last, but certainly not least, we must also update the web.config for the SecurityToken service. 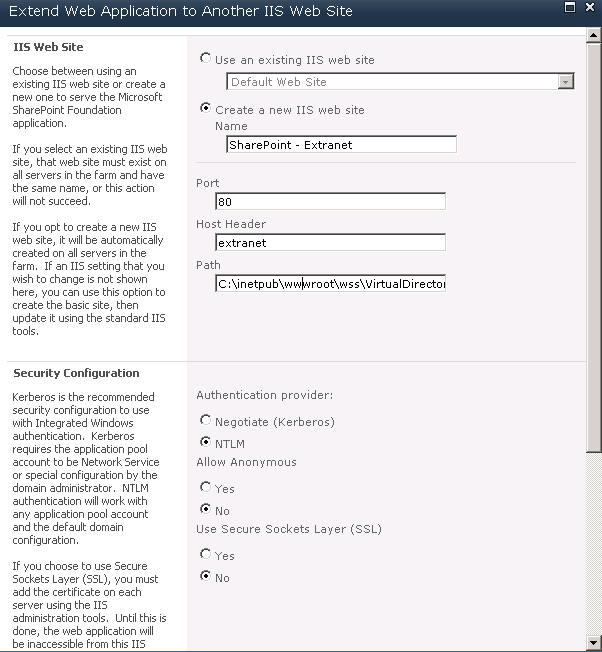 Within your SharePoint Root folder, under WebServices\SecurityToken (generally found at C:\Program Files\Common Files\Microsoft Shared\Web Server Extensions\14\WebServices\SecurityToken), you will find another web.config file. Before the end <configuration> </configuration> section, add in the following… again, tailored to your configuration which we have specified above. Once you do that, it would be healthy to restart IIS as well (just humor me on this one, while not required, as changes to the web.config will cause the application pools to recycle, I’ve seen issues where a reset to IIS has been known to do good). You should be configured, and ready to roll! Now stay tuned for Part 3… get access to this test environment! Pingback: SharePoint Daily » Blog Archive » Microsoft Pushes SharePoint Cloud; Public Cloud vs. Private Cloud; Can MS & Nokia Challenge Apple? Great post good detailed steps for an important and often require process. Unfortunately there is a problem with the steps, specifically the change of the web-application from Classic to Claims does not migrate the site fully resulting in some issues if for example you use Project Server 2010, where these steps will cause all Project webparts to fail with “An unknown error has occurred”! 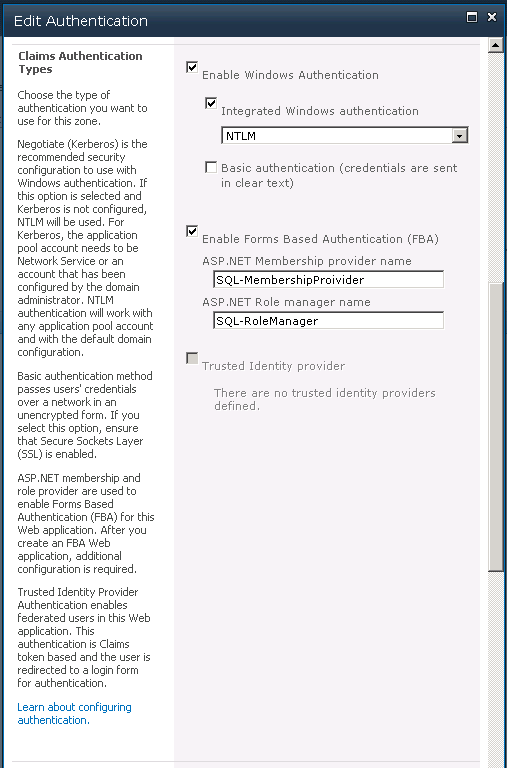 Far better to use the following: Migrate from classic-mode to claims-based authentication from TechNet, this will migrate the existing site admin user correctly. Although after doing the above I did have to make the changes to the portalsuperuseraccount & portalsuperreaderaccount then also use Move-SPUser to migrate the remaining user accounts to their Claims based identities: E.g. instead of “DOMAIN\user” now “i:0#.w|domain\user”. Hope this helps others out there!